For a smooth custom clearance, it is important that you send on time the authority letter to the custom commissioner, in case the IEC holder fails to be present for custom clearing. It is a kind of power of attorney which gives someone else the authority to have your consigned goods cleared through customs for you, on your behalf. Such a letter is needed by all of us because we cannot be present all the times to collect our goods and therefore, need to give some third party the authority to do so. Here is an example format of authority letter to write to deputy commissioner of customs which you can customize as per your requirement. Such letters are to be written on Company’s letterhead. Diwakar Foods and Spices Pvt. Ltd.
We, hereby, authorize Vardhman Shipping Services and its affiliates to make arrangements for custom clearance and delivery of our consigned goods. We, therefore, authorize them to act as our agents and undertake all necessary steps like documentation, declaration, custom clearance, octroi clearance etc. of the imported consignment as and when required. All goods transported through Vardhman Shipping Services network arriving at different customs airports in India. All the import shipments of our company addressed to our different branches within India. This authorization letter shall remain valid and will continue until revoked. 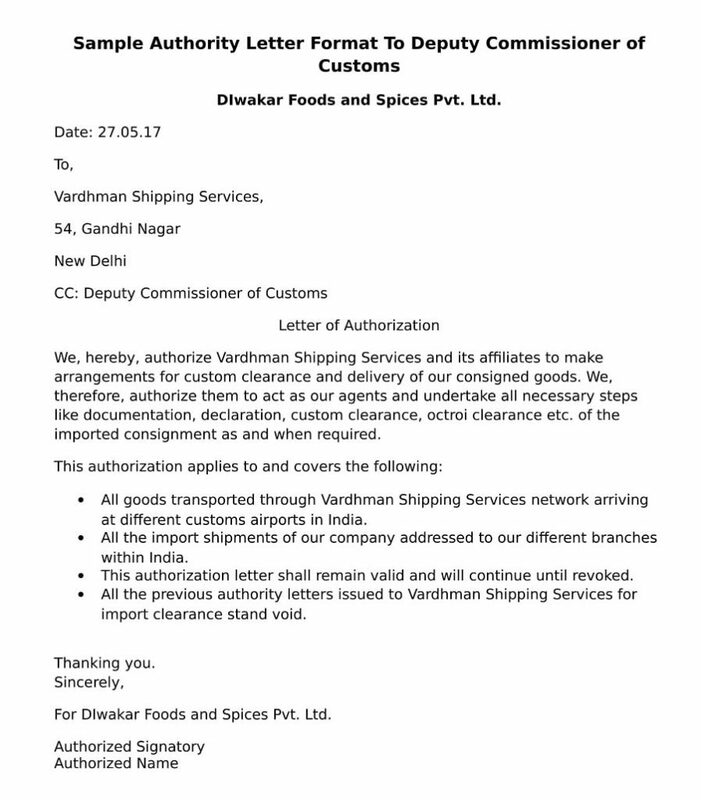 All the previous authority letters issued to Vardhman Shipping Services for import clearance stand void. For Diwakar Foods and Spices Pvt. Ltd.